Yogi: Habitual strong aversion when old problem resurfaces. 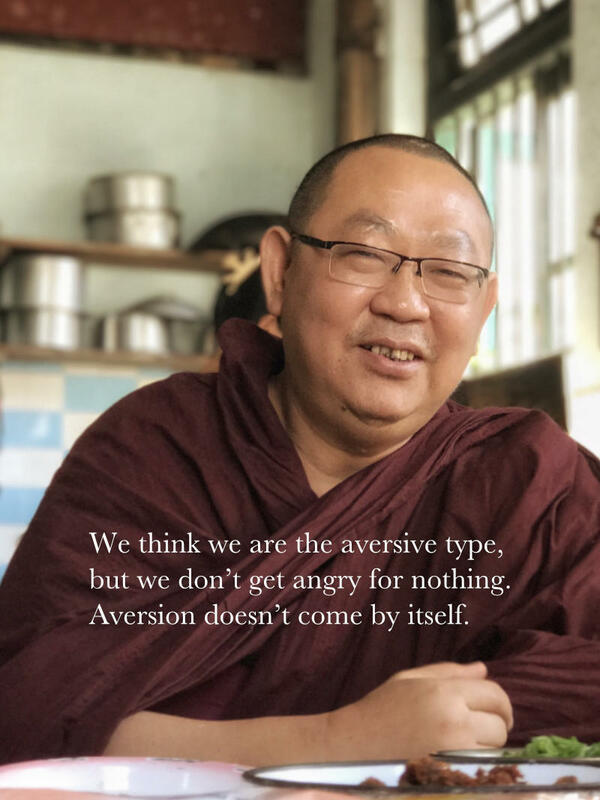 Sayadaw: Aversion is the problem; check your attitude. If there is aversion, worry, or anxiety, come to the mind; watch the mind first, be aware of the aversion. If right attitude is present, the defilements must decrease. Awareness and thinking are different – if we are aware some time but still continue to think about the object, then the defilement will continue or increase. People don’t understand how much the mind suffers due to defilements – that’s why they continue to happen. You need to learn how much the mind suffers; then naturally you will let go. Be patient. Just continue to watch and learn from the process, just learn. Don’t try to change your thinking or the experience. Experience is not your responsibility. You cannot avoid it because it is the effect of past conditions. You have to face it and learn from it. [Notice that] the watching mind is equanimous, but the object is suffering. So, let it be. Real experiences are very important. They teach you; you cannot buy them. You need to have right view, that’s it. You cannot avoid defilements – anger is the most obvious defilement. Welcome them and learn from them. You cannot avoid this state; you have to go through it. If your understanding deepens from the experience, the mind naturally becomes more peaceful. Yogi: If we are trying to cultivate wholesome thoughts, how can we not be adverse to unwholesome thoughts? Sayadaw: There is the object and there is the mind when we talk of cultivation. Remember that meditation is about cultivating the mind, not the object. When you talk about experiencing an unwholesome thought, unwholesome thought becomes the object because you know the unwholesome thought. And you are cultivating the observing mind, not the object. If you bring in right view, and you remind yourself that it’s the unwholesome thought that is being observed and that it is just nature, you’re no longer giving fuel or reacting to the unwholesome thought. So, there is no more aversion to the aversion. The unwholesome thought might have some momentum, but because you’re not feeding that momentum, the thought won’t grow and when it runs out of steam, it will go away. Yogi: How not to let irritation & impatience become full blown anger? Sometimes it’s so quick and I’m living with someone who has dementia. I’m confused but I think it is aversion because I don’t want things to be like that. Sayadaw: First, you have to be checking your attitude all the time. And the second thing is that you have to catch the irritation when it is small. Because when it is small, it is easier to handle; you can watch it and it won’t grow so big if you’re watching it. But if it is already big, then nothing much can be done about it. Yogi: But my intention is not to do harm. Sayadaw: The intention not to harm is a wider intention. We can have good aspirations, but when the defilements come, the mind forgets. Although we have the intention not to harm but we might in our defiled unwholesome state unwittingly cause some small or greater harm. In the beginning when awareness is not established, dealing with the mind can be quite challenging. How to strengthen the awareness? Make awareness more continuous by using a neutral object like the body. Build up the awareness first with physical objects and go back to the anxiety in the mind, back and forth. Remember to check that we are watching with the right attitude – that we are not identifying with the problem and wanting to fix it. Rather, think of anxiety as a force of nature – anxiety has its nature, its characteristics and its job description and you want to understand its job description (how it works and what it does, as if an auditor is checking anxiety doing its work). The primary skill in vipassana meditation is learning to watch objectively and with interest/curiosity. You need lots of experience and patience. In the meantime, you will be angry, there will be aversion and you will be aware. And you will have more awareness – aversion will do its work and awareness will do its work. If you’re watching aversion and it still continues, it means that you’re still letting the defilement arise – one part is watching and one part is still thinking about the storyline. You’re not watching properly. One part is still complaining, right? Totally watch, don’t complain anymore; then aversion comes down. It could also be that you are being aware, but you don’t have wisdom, so the aversion continues. You’re not learning, therefore the defilement has a chance to continue. Your eyes are open, but your attention is at the person. If you pay attention to seeing, no problem; but you don’t know how to be aware of seeing. You’re not skillful yet. That’s why the mind is thinking about the object, about the person. That’s why aversion arises. If you can be aware of seeing and knowing, not paying attention to the person but to nature, aversion doesn’t arise. Now, because you’re not skillful at watching seeing, the mind starts to think about the person, the concept. If you cannot stop thinking about the person, then you can watch your mind, watch the aversion. This is better than closing your eyes because in daily life you cannot practice this way – closing your eyes whenever someone comes. The same anger doesn’t happen over and over again. This is just an idea – it is new, new, new. When you have this idea, then the mind wants to resist because of over and over again. But nature is always new; the old anger is totally gone. Everything is new experience. If you have right view, the mind will be interested every time. If you’re thinking that it’s old –that it comes again and again – then you want to resist. You want to do something because it’s boring. Every nature is new; not old defilement, new defilement. Now you think that the old defilement cannot go away; this is a concept. Reality is always new. Like pain, you think the pain before 5 minutes until now is the same pain. This pain is not reality; it is concept pain. Before 5 minutes until now, you’re paying attention to concept. If you see the reality/nature of the physical process, it is always changing; everything new, not old pain. It is the same with mental process. The important thing is mind reaction, not bodily pain. If you can, use right thought and right attitude to watch the anger first. If you cannot watch because the emotion is too strong, you can switch to a physical neutral object to calm the mind down. If you cannot change the mind, you need to change the object. It’s faster if we can change our mind. If we have right thought and understanding, our mind changes quickly. Our mind state changes when our idea changes; and then everything is okay. But if you’re not skillful and wisdom is not strong enough, you cannot change your idea; so your mind cannot change; then we watch. We don’t think of anything, but just watch our feeling continuously. Then our feeling will also settle down, the reaction becomes less and less because we are not thinking about it. If your awareness is not strong enough and you cannot watch the feeling then we need to change the object or our posture. When the mind calms down, then you can continue to meditate. Otherwise, your aversion increases and you cannot meditate. Object and mind are related. When you change to a neutral physical object, then the mind becomes neutral. When physical object is pleasant, the mind is also pleasant. If physical object is suffering, then the mind reacts with aversion. So, if we cannot change our mind, we can change to a physical object to calm the mind down first. Yogi: When the mind becomes agitated during sitting meditation, it doesn’t want to sit anymore. Sayadaw: Whatever happens also becomes an object; because of wrong idea, the mind becomes bored. Because you think that agitation is not good. So, you need to think that agitation is also one kind of object. That’s it – whatever happens is also an object. Agitation is also one kind of meditation object; but if you judge that it is not good, you become bored because you want a good state, you don’t like this state, then the mind becomes bored. This is because of wrong attitude, wrong idea; so you need to change your idea. Whatever happens, don’t judge it to be good or bad. You already know that it is happening; everything is an object. If you think the experience as an object, then you become interested. If you judge it and want something to become better, then you’ll be bored. Because of expectation to be good, then when you get a bad state, you become bored. Whatever happens, let it be. Try to be aware; maintain the awareness continuously. You need to change your attitude. We think that we are the aversive type, but we don’t get angry for nothing. Aversion doesn’t come by itself. People often say ‘I’m the anger type, but I don’t have much greed’, but aversion is the result of having unfulfilled greed. We are all the greed type, and delusion type. You have heard of some yogis who have had very bad experiences in meditation retreats and it affects them mentally. And most of the time, it’s because of greed – all these yogis have spun into a cycle of high greed. It is so important to see greed in the mind, but these yogis don’t see. The signboard they put in front of their mind is ‘I’m meditating’, but what is doing the meditation is greed. So, that’s why Sayadaw defines meditation, at the beginning, as cultivating wholesome qualities of the mind. A yogi reports seeing so much wanting and how his anxieties arise from wanting. Sayadaw: Because of wanting too much, when there are 10 things you want, even if you cannot get only one, you’ll become upset or depressed. If strong desire is there, and you cannot get what you want, then aversion will come all the time. [So, whenever the mind is calm, check if] the mind is calm because it already gets what it wants. Sayadaw: Always check the quality of the mind; if the mind is suffering, defilement is definitely present. Grief happens when one can’t bear something that has happened. Even when you’re further on in your practice, in times when there is not so much wisdom, we might still grieve. When there are mindfulness and wisdom, it is less likely, but when they are absent, it can become quite strong. Yogi: How does one view hindrances in this practice since they are by nature obstacles? Sayadaw: In the Satipathana Sutta, when we get to the 3rd and 4th foundations of mindfulness –Cittanupassana and Dhammanupassana – the hindrances become objects; they just need to be observed. When you do sitting, don’t pay too much attention to the mental tension. If there is a reaction, know the reaction. Otherwise ignore it – as like you know it’s there but you don’t look at it – and look at something else; better to watch your feelings or your reactions. If you find the mind going there because of the preoccupation, bring it away. If we sit and we have a reaction to something and we keep watching that and we’re not watching the reaction, after a long time it becomes a habit. There are yogis who sit with things they don’t like without knowing their reaction, it becomes a preoccupation for the mind that whenever they sit this is the first thing that comes up just because the mind already doesn’t like it and is expecting it to come. So, in a way the disliking mind is almost anticipating it and therefore bringing it on. So if they sit with it for months, it takes months to undo it. There is one yogi who always feels like there’s a tight ring around the head when he’s meditating. I advise him not to look at it because it creates more reaction in the mind and it’s not real; it’s like the projection of the disliking mind. So, don’t pay attention to it; watch the disliking or other objects. The primary skill, the true skill in meditation is learning to watch objectively without any reaction towards what is being observed. When we have any negative experience, whether pain, sound or emotion, the mind’s instant reaction is resistance towards this experience. Our habit is whenever we have aversion we instantly have aversion to the aversion and so on. We don’t see it as nature and right view is so lacking. We don’t have the skill yet to have right view, so we make the effort to bring in right view intellectually. We need lots of practice. [On the cushion] we don’t just move because there is pain; we move when something is unbearable. If we like the feeling of pain, like when we get a massage and it is painful, we don’t want to move, right? We move when something feels unbearable. Between pain and the feeling of something being unbearable, it is the latter that is more prevalent in the mind. And that’s what we want to watch; not the physical pain, but the feeling of discomfort in the mind that doesn’t want to bear with it. And that’s what we call watching vedana. Vedana is what the mind feels. Pain is not vedana, pain is rupa; it is physical, a physical phenomenon. It’s the mental quality associated with the pain that is vedana. We should not force ourselves to watch the pain intolerably. When pain first starts, watch the mind that feels that it really doesn’t want to be there. Watch that mind for as long as you can and when it really doesn’t want to be there, then move and make yourself comfortable. You don’t have to bear more burden than you can bear. Challenge yourself to watch the mind that is uncomfortable for as long as you can, a little at a time. If you watch the discomfort past the point that the mind finds tolerable, at that point you’re not just observing anymore. It’s the dosa in the mind that is growing and we don’t want to practice to just grow dosa or aversion in the mind. The other extreme is not trying to do that, you don’t try to watch the discomfort in the mind. There‘s a little bit of pain and you say 'Okay'; you decide to move and make yourself comfortable. So, to constantly try to make yourself comfortable is the other extreme. But that’s not trying to practice either; we’re just trying to avoid facing the pain. Remember that when we’re watching the discomfort in the mind, we’re also developing the skill of how to recognize and know the mind. The easiest way to recognize the mind and to be aware of it is through watching feelings and thoughts or thinking mind. Pain is the name that aversion gives to the experience [yogi's note: if it were greed, it would be another name.] When there is no more aversion you cannot experience it as pain anymore. And therefore pain is gone. When there is aversion, things are experienced as solid and hard. So, it feels painful. But when there is no more aversion, they become soft fluff and pain disappears. This brings sharply into focus how strongly perception is colored by wholesome and unwholesome minds. So, when we don’t see what’s in the mind, but just the objects, it is hard to trust the quality of the object because we need to check if it’s being judged by the defilement or wholesome mind. When anxiety arises, we need not think it as a problem; the anxiety is nature. But the mind is not happy. Unpleasant feeling is there, there is resistance. Then you watch the aversion reaction first. Don’t watch the anxiety first; the mind is not ready yet. When the mind resists an object, this object cannot be used as a meditation object yet. We need to change our mind to right attitude and watch our feeling first. For example, if you are angry with someone, if you continuously look at that person, the anger will increase. That’s why we need to change the direction, check our attitude and mental state first. The anxiety is not the problem, but resistance/anger is the problem. As much as you can, try to be aware of your feeling. When you are anxious how do you feel? Is it pleasant or unpleasant physically and mentally? Every time the mind knows, it doesn’t want to be anxious anymore because there is too much suffering. What idea has caused the mind to be anxious? The mind has an idea that something is unacceptable, and it is anxious because it has an idea of something that it thinks is unacceptable, not someone or something outside there. Why is the mind anxious? Before it was not anxious, now it is anxious, why? See the mind process – what activities of the mind that made the mind anxious? Whenever there is any understanding arising, the defilement stops and the anxiety decreased. Is anxiety necessary or not? Sayadaw: Watch physical pain and feelings back and forth repeatedly. Later when the mind is more skilful it can watch both together, it knows what is feeling and what is object. When you watch them simultaneously, then you can better understand cause and effect. Yogi: So you keep going back and forth, back and forth, what is the purpose? Sayadaw: In the beginning, you are trying to gain skill in knowing what is feeling and what is object. Yogi: What is the next thing to do? Sayadaw: Just watch and investigate; that’s it. It there’s no more reaction, what is happening in the mind then? What’s the understanding about the pain? You need to watch the defilement feeling until it drops to zero, no more defilement, then what do you see in the object? At that time, the meaning of pain disappears. Between pain and defilement, defilement is more important. Now you understand that because of mind, the pain is different. If the mind changes, then object changes. So you need to take care of the mind. If defilement becomes zero, what happens? Yogi: But I cannot get there yet? Sayadaw: So, continue to watch and learn. You can still see the subtle defilement, so keep your eye on it. Yogi: I keep observing it, but it cannot go away. Sayadaw: It does not matter. You are not trying to make it go away. If your awareness becomes stronger and stronger, the defilement slowly decreases. And also you can learn something about the defilement. So, don’t give up when it is subtle; stay with the pain, continue to keep your eye on it. Investigation is not superficial; you investigate from beginning to the end. When you get a more complete picture, realisation arises. Investigation is learning to see the whole process. Sayadaw: You can investigate in many ways. Now we are watching the relationship between mind and body, that’s why you watch the object and the feeling, right? You can try to understand what the feeling is, and whose feeling? If you can investigate from different angles, you get different answers. There are many ways to investigate, many angles to watch one process. It says in the Satipathana Sutta that when something is happening, you should know that it is happening. When it disappears, you know that something has disappeared. This is not enough, there’s more to it. You should know why it happens, why it continues, why it decreases. For example, anger. You know anger is present and it has disappeared. Why anger arises, you don’t know. Right? You need to investigate more. Why anger continues? Sometimes, it lasts for a short time; sometimes it continuous for days. Also, why defilement decreases? The Sutta encourages us to explore more. Then you have a better understanding of nature; there are many ways to investigate. First, you know how to watch the physical object and the mind (feeling). Then you can explore more – it is very interesting. What is it? How it is happening? Why it is happening? When there are many questions, then it is very interesting. It is not enough that you understand a little bit. If you explore more, different questions come, different answers come. When understanding grows, naturally more questions come. When wisdom grows, the mind knows how to investigate more. So, how can investigation be boring? Because new questions come, the mind becomes awake and alert because the mind wants to find out. Ask questions to encourage the mind to watch and learn, but thinking must be thinking about present moment experience to support awareness. Investigation doesn’t mean that you need to get any answers. If investigation makes you tired, then you’re thinking too much. Asking questions can make the mind curious about learning. Many yogis misunderstand this. When I say investigate, they think they should try to figure it out. But that’s not it. You ask a question and then just observe. So, the rest of it is observation. The question is just to direct the mind’s attention. You may not even need a question. Just like a scientist that sets up a hypothesis and then do a lot of observation. How is it that yogis can bear the pain when meditating, but they can’t during normal time? This is your homework. Later you try to check your mind – what is the difference when you’re meditating and when you’re not meditating. Our attitude should be: we don’t want the pain to go away. Let it be there; we can learn better. Let the anger stay there – then you can learn. That’s good; that’s good. You can learn from this. This is the Dhamma; this is the real Dhamma. You can use this to grow your understanding. However, you think that the pain is very bad hence you resist. Don’t run away from the aversion and pain. Face it little by little and you will understand that all this is Dhamma. If the practice is right, the aversion will decrease. Due to right attitude, the anger decreases. Yogi: Why do we observe pain at all? Why don’t we just make ourselves comfortable? So, no need to observe pain. Sayadaw: We want to understand something about pain; then you have to watch it, not avoid watching it. When there is pain, the first thing that we need to check is whether the mind is resisting the pain; whether the mind feels uncomfortable. If it is uncomfortable, then we don’t watch the pain, we watch the DISCOMFORT in the mind. And then when there is no more discomfort in the mind, we look back to see if the mind still feels painful. Because when the mind has the slightest resistance, it is not seeing the nature of pain as it is. When there is completely no discomfort, zero discomfort, in the mind, what used to be pain becomes something very interesting; the meaning of pain disappears altogether. Yogi: Are we practicing to switch pain off completely? 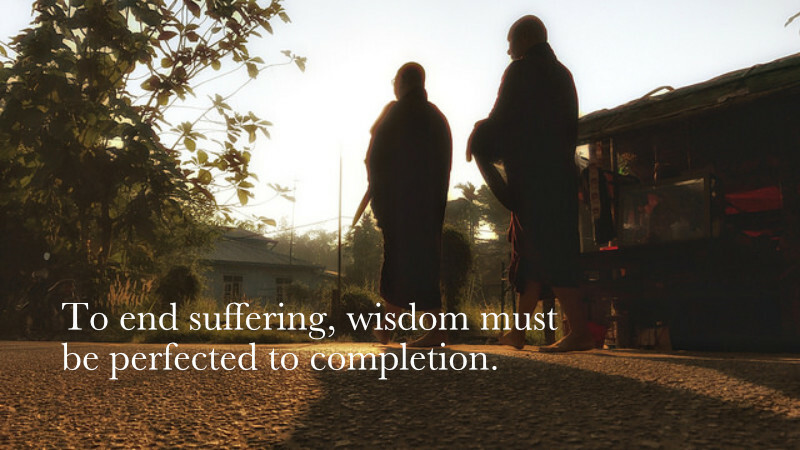 Sayadaw: Meditation is not a method to learn how to conquer pain. It is not about the pain going away; it’s only about learning enough to know how not to react to the pain. First, by actually seeing how the mind reacts to pain. Like when we are dying from a disease, we might be in a lot of pain and the pain is never going to go away. But we can learn to not be constantly suffering due to the pain; that the mind can learn that when it is less resistant, it can feel less painful. When we understand what pain is, that it is actually a perception of the mind, then when we are dying, we can die smiling even when there is pain because the mind is not overwhelmed by the pain because it is not so much about the mind making it go away as that the mind is unaffected by the pain. It is not that the mind bears the pain; rather, it is because the mind no longer has to bear the pain. When there is physical pain, we are learning when we watch the reaction, the discomfort, in the mind. If you watch it continuously and you’re not thinking about the pain, the discomfort can subside; and it can subside to the point that it feels like there is no discomfort anymore in the mind. And then you might notice that the physical pain is still there but the mind no longer has any discomfort. That is possible to achieve. It is just about pushing the boundary a little bit each time to discover how you can watch the reaction in the mind and what happens to the reaction? Does it really come down, can it be contained; can you watch it, accept it? When somebody says something and it hurts us, if we can understand that it’s the anger that did it, not the person, then it’s easier to let go. If it’s a person, that person is always there, but anger is not always there. When anger is not there, the person is not like that. So, it is anger that does it, not the person – see the principle at work, rather than a being. Yogi: How do I know if I have dropped negative thoughts due to understanding or that I’m suppressing them because of aversion? Sayadaw: Check whether it’s aversion that’s pushing away the thoughts, or wisdom that understands dropping them is the skillful way. Is there aversion? You have to check for yourself. If there are both aversion and understanding, watch the aversion and the understanding. Keep an eye on both of them. Do not avoid the aversion. You want to know why these negative thoughts are here or have gone. So, if you check whether the aversion and wisdom are present or absent, then you’ll know if you’re suppressing the negative thoughts or letting them go. Just watch. These are subtle things [thoughts that are not clear or entrenched] happening in the mind. You need to know the subtle things as well as the things that are easy to observe. If we don’t keep an eye on the subtle thoughts, they can stick around and brew. Sayadaw doesn’t encourage us to practice by moving slowly because none of us slows down in daily life. If we practice by moving slowly in retreat, we cannot transfer it to daily life. Although sportsmen move super fast, they are still very aware – for example, the swimmers are very aware of their body, how they use their energy and everything else – only the objects change for different athletics. In my daily life, every morning I jogged. I was very mindful, in very good state, very mindful non-stop till the end. The mind is very settled down, very calm. Body moves all the time, but I was aware of breathing. It can be done. Whatever you do, if you don’t hurry, you can be aware. Sometimes, you need to do things fast; at that time, you don’t need to be aware in detail. Just one object is enough, but make it continuous, e.g. the breath when jogging. Then you can maintain awareness. If you can maintain awareness, then the mind can be calm and peaceful. At that time you can think properly how to get the job done well. You must be skilful how to be aware of your thoughts. Sometimes in many things we do, we have to think of multiple jobs (multi-tasking). So the awareness must be very fast. So, I don’t encourage people to slow down to be mindful; it cannot be applied in daily life. For me too, I try to be aware of whatever I do in daily life. In the beginning, one thing at a time is enough. And day by day, awareness slowly and slowly becomes a habit. Just like a martial arts exponent. He starts with 1 punch at a time. But later, he is adept at multiple punches at a go. Practice till it becomes a habit. Mind is very fast – 17 times faster than body. No matter how fast the body, the mind can follow. Practice and make it habitual. Now, you observe only 1 object at a time, so how to move. So you need to practice for a long time seeing, hearing, thinking and feeling. Try to practice using many objects so that you can be skilled at observing many objects, then the mind becomes faster and faster. Before, when we practice walking, we only observe the touching, no problem. But we make touching continuous … touching, touching, touching. If the awareness becomes continuous, slowly, the mind knows many things. And you must know how to watch your emotions. This is more difficult and important. When you hurry, hurry, awareness is gone. Anxiety comes, awareness is gone. Also, your awareness must be strong and ready all the time; then when emotion/anger comes, they can go away fast. So, don’t let your mind roam free. In daily life whenever the mind is calm and free, I use my mind to focus on something, to prepare the mind for any eventuality. In this case, when emotion/anger appears, it last only a few seconds and I can then continue with whatever I was doing. Previously, every time emotion came, I couldn’t handle it and I would have to go to the toilet to cool done. In the beginning it was like this. If you can maintain mindfulness, the quality of your job becomes better and better. If you hurry, you may get things done wrong. If you’re mindful, it could be slower, but you’ll be more efficient. Day by day, you learn how to practice to be aware of what is happening and slowly you can maintain your practice in daily life, in your work. Now in the workplace, when people are free, they gossip and allow their minds to roam free, not maintaining it in a prepared state of awareness. Then when anything happens, they panic. Your becoming tense now is already the effect – that is already bad kamma. If it keeps on going for a long time, it’ll be a problem for both the body and mind. When you work, you should look for a way to work more calmly, to overcome the tension and stress. If you have awareness, you can find a solution. If you have nightmares, when you wake up you can use fearful feelings and body sensation together as objects of meditation.